Dr Christine C Dierickx received her MD degree from the University of Leuven, Belgium, where she also completed a dermatology residency. She then gained expertise in phlebology during a 2-year fellowship with Professor H Neuman in the Netherlands. Subsequently, she finished a clinical laser fellowship with Dr R Fitzpatrick in San Diego, CA, and a Mohs fellowship with Dr F Mohs in Madison, WI, USA. During a 2-year laser fellowship with Dr R Rox Anderson at Massachusetts General Hospital, she developed research laser expertise in various fields. Projects on vascular lesions draw directly upon her research on the thermal relaxation time of ectatic blood vessels. She established the need of millisecond laser pulses for the treatment of vascular lesions and showed the formation of gentle cavitations driven by a slow photothermal process underlies the destruction of blood vessels with longer millisecond laser pulses. This work earned her the Best Basic Science Award of the American Society for Laser Medicine and Surgery. 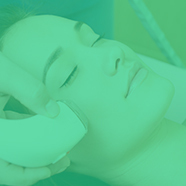 As a full-time staff member of the Wellman Laboratories, Harvard, she conducted research with long-pulsed ruby and diode lasers for hair removal. She returned to Belgium in 1999, where she is in private practice, and continues to be involved in the development of new laser and dermato-cosmetic applications and new applications for photodynamic therapy. She has published and lectured nationally and internationally in laser surgery and photodynamic therapy.